Ramos Gin Fizz. Photo by Donna Turner Ruhlman. I’ll be doing a couple cocktails featuring the egg as this is the month of Egg, my new book exploring the world’s most versatile ingredient. The stuff of life. Seriously. We’re lucky each time we eat one (unless you’re Paul Newman playing Cool Hand Luke). We’re luckier still every time we drink one! They are great in cocktails. Last week I featured the whiskey sour. A favorite of my Grandma Spamer, who would have been 97 today. Though by the time I saw her drink them, they were made with frozen lime concentrate or some such, and certainly no egg white. And frankly a sour doesn’t have to have an egg white. Oh, but add an egg white and they become substantial. They are more satisfying on every level, with real body to carry that sweet-sour-whiskey wallop to its most satisfying conclusion, over the palate and into the gullet, with a nutritional finish. 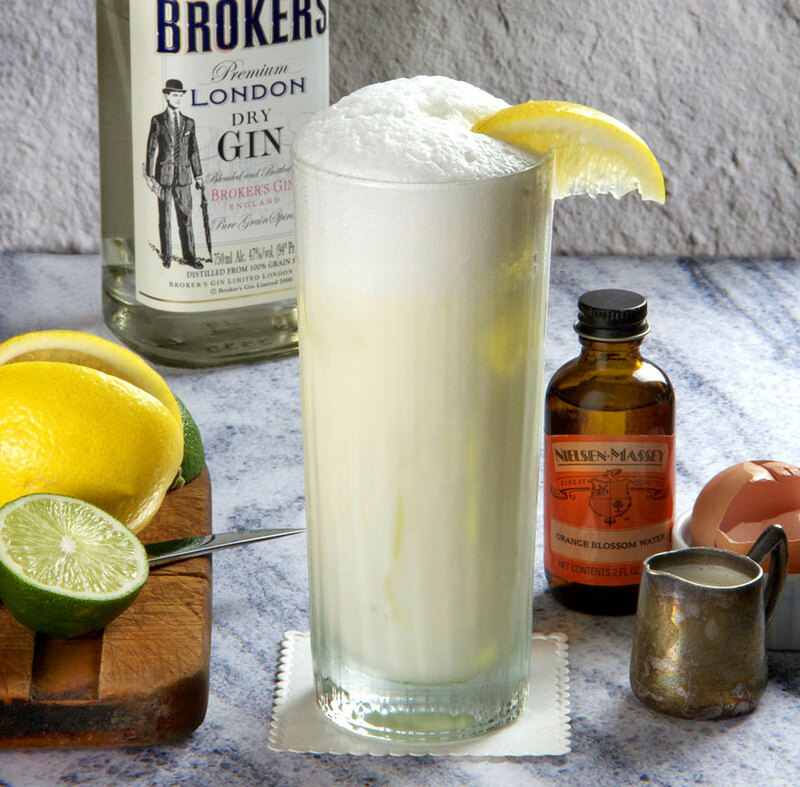 One of the most esteemed cocktails known for including egg is the Ramos Gin Fizz. Have a look at the history and all the gin fizz variants on Wikipedia. I love its combination of citrus and cream, reminds me of the orange creamsicles I adored as a boy. And the orange blossom water adds a delightful, completely unique, and fragrant finish to this substantial and refreshing cocktail. Technique: As with all cocktails including egg white, they require a dry shake—that is, one shakes before adding ice to the shaker to unwind those egg white proteins, making it smooth and not viscous. Then one adds ice and shakes to mix further and chill. I have changed my method, using a hand blender, which fits neatly in my shaker. This mixes the drink (and ensures that the sugar dissolves) far more effectively than a dry shake, though with less fanfare. I then add ice, shake, and strain into a glass over ice and finish with soda water. Using a blender for serving this drink to a group is completely acceptable. But shaking is important. Especially if you feel like knocking off early on this spring Friday. Tell your colleagues it’s time for your protein shake. Combine all the ingredients, except the soda and garnish, in a shaker. Dry shake or mix with an immersion blender. Add ice. Shake to chill thoroughly. My recent posts on the Whiskey Sour, Bourbon Milk Punch, and Operation Neptune. Serious Eats covers why you use egg whites in cocktails. Esquire magazine has a great collection of cocktails. Food Republic shares their 7 most influential cocktails of all time. Have you considered making a cocktail with meringue and pastry cream, like the classic chibouste? This is pretty close. i love chiboust, but think you’d have to make a chiboust based on a cocktail, not the reverse. Looks like it was taken in the Greek Peloponnese islands. Is this a different kitchen or a mock up? I know when you’ve taken a great photo by how much I want one, and this one is very tempting, right up there with your eggnog photo. White on white, with a little citrus accent. Creamsicle sounds pretty good right now too. not friday without a comment from you allen. donna is just playing with some different backgrounds…I’ll tell her what you said. thanks! And please mention that cute little pitcher blending in with the marble, gin label and pairing knife. I’m so much more observant when sober. Seeking forgiveness for past drunken rants too. Not finding myself worthy of such, with so many repeat offense, but you have my sincerest sober apologies . I tried your whisky sour from last week, my first taste with the egg white and it did make a great difference. It was pretty good, but sour (guess it’s our lemons, more simple syrup next time). Now on to find the orange blossom water for this one! My ratio is all equal parts. equal parts sour and simple syrup and the simple syrup is equal parts sugar and water by volume. doing it by weight will give you a sweeter syrup. A bartender at Bar Bouchon, Beverly Hills first gave me this drink a couple of summers ago and I was hooked. I asked him what was in it and he listed all of these ingredients…but then said…”I like to add milk rather than cream, it lightens the drink up a bit.” In my opinion, it’s a great substitution. I love this drink, thanks for sharing a recipe so I can make my own. Where did you find orange blossom water? I had to drive about 45 minutes to Parma to get my last bottle. In the written recipe you forget to mention to finish with soda water (as mentioned in the article). For the full effect, pour 2-3 oz. of club soda in the glass, THEN, add the Ramos mixture. I’ve always said, The Ramos Gin Fizz is the perfect Sunday morning cocktail…. And one more thing, after you add ice, you really need to shake the hell out of it. Use the largest, coldest cubes you can to minimize shattering. thanks for weighing in, paulius! This sounds as though it may be the definitive recipe! Because I’ve been away awhile, today is the first time I’ve seen your new logo. Love the idea and the execution! It’s time for my protein shake! This is a classic that I just can’t get enough of. Can’t wait to get my own hand blender too.